As someone who does indeed remember using cassette tapes these 60 minuet tape Nano Cases are a joy to look at, but then again I would have been more impressed if it was a stand alone player, but still great recycling of tapes none the less. 9 – No Chair-leaders required! If you fancy a little touch of the 80′s in your home then you could do far worst than this rather beautiful, eco-friendly lamp made from old cassette tapes. I think this looks great and might have to have a go at making one myself. 7 – Keeping my memories and moneys! 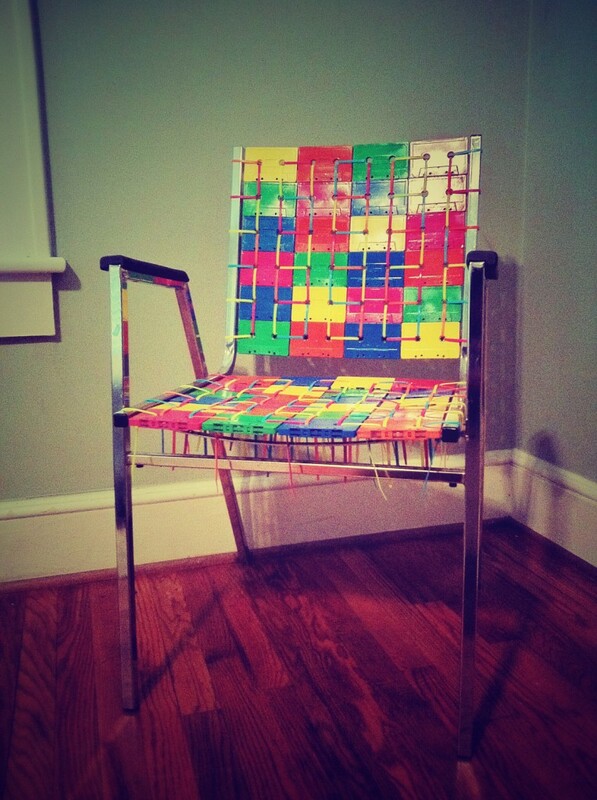 Nothing too complicated here, just a great recycling idea done with an upcycled cassette tape. I kind of like it because it would make a great talking point out of a normal use object. 6 – Keep calm and remain stationary! Now here is one that even I can have a go at making! And while I am sure that no-one would need it, there is a great step-by-step making guide in the image link. This CD rack that is made from old cassette tapes is in fact quite easy to make, you see tapes have several holes in them that were originally used to keep it in place in the cassette player so all you need is a few screw bars, buts and screw nuts on the ends! 4 – Keep those sweat bands safe! What better way to keep your Jewellery safe than a cool, retro looking jewellery box this is made using upcycled cassette tapes! Not a bad thing to make with tapes at all. What I like about this idea is that it uses the holes that secured the tape in the player with great effect. So if you are the type of person who still writes a shopping list down or like me needs to write your blog ideas down A.S.A.P because otherwise your forget them, this is the perfect gift for you. While this is well above my own skill level it isn’t for the artist Brian Dettmer. You see, he makes amazing skeletons out of old cassette tapes! For some reason the tapes colours and shapes seen to make some of his works very life like indeed. 1 – Retro furniture at its finest. Recycling old tapes just don’t get any more grand than this cupboard made from just under 1000 old cassettes! Done by Dutch designer Patrick Schuur it is nothing short of incredible and really doesn’t look that hard to make ourselves.